08 Feb Seedy Sunday this Weekend! we emerge from our winter hibernation and gather together and talk seeds. People walk through the door with giant smiles on their faces, so happy to see Natureworks open! 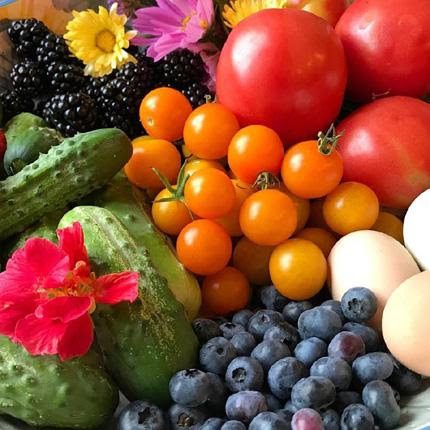 Our racks are stocked with thousands of organic untreated seeds- veggies, flowers, herbs, microgreens… it’s a seed-lover’s delight! We have organic seed starting soil, trays, and everything you need to get started. Not to mention information and lists of what to start when. Sandy Merrill, CT’s seed EXPERT, will be joining us to answer your questions. Don’t miss this fun day. While you are at the shop, pick up a copy of our class brochure and secure a spot in one of Sandy’s two seed starting workshops in our greenhouse in late March. I chose all the types of seed to order. 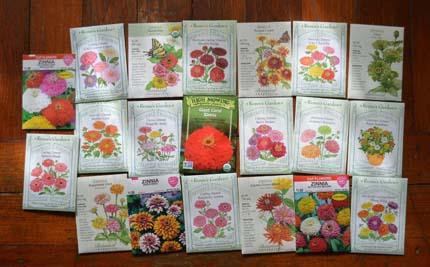 These are just “some” of the zinnia varieties we have on our racks! Diane and Amber also wanted me to mention that they have gathered lots of merchandise that they don’t want to have to move or display again and have created an awesome tag sale. I can’t bear to look at the prices, but I guess they mean business, let’s get this stuff out of here because our shipping and receiving porch is so full, you can barely open the door! The NEW merchandise yet to be unpacked is headed up to the CT Flower and Garden Show which is only a few weeks away, February 22-25th. Yes, we still have discount flower show tickets for sale. 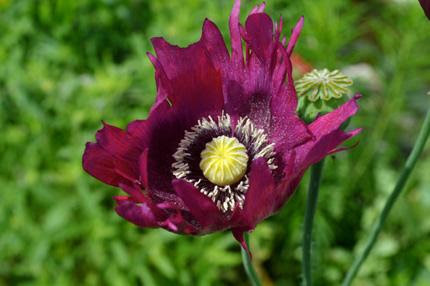 ‘Lauren’s Grape’ breadseed poppies are just one of the many poppy seeds featured. Sow on cold soil in March! Sunday is your chance to stock up. 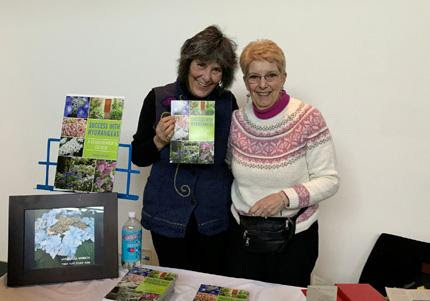 Last Saturday we attended a wonderful workshop put on by the CT Horticultural Society. We all learned so much. I was especially thrilled to hear Claudia West speak about designing plant communities. This is a totally new way of looking at the way we plant and manage our landscapes. 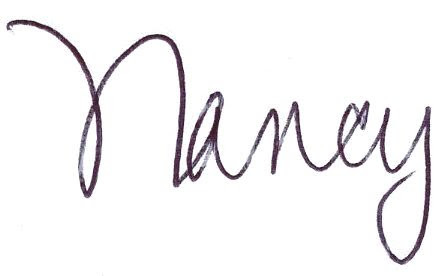 Having studied her book, hearing her speak made it SO much clearer. I will attempt to explain this to you guys at our upcoming all day seminar Growing a Healthy Yard. Two of the workshops that day will deal with this- An Introduction to Plant Communities and Eek! Weeds! What do weeds have to do with designed plant communities? Everything! Click here to download the class brochure. The second it was announced, registrations started coming in. You can register on-line, it’s so easy. Lorraine and I had a blast last Saturday at the CHS Conference. Sign up SOON for her class on Pruning Hydrangeas. It’s going to fill up. We now have lots of signed copies of Lorraine Ballato’s new book Success with Hydrangeas in stock for Seedy Sunday. Wait until you get your hands on this! 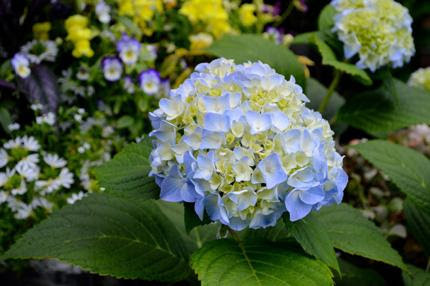 And don’t forget to register early for her April 7th workshop dedicated to Pruning Hydrangeas. The word is out and this is going to fill up fast. So get yourselves up and out of your winter doldrums and come into Natureworks for the seediest celebration you can imagine. It will lift your spirits and get you super psyched for spring. Sign up for classes so you know you will have something to look forward to while you wait for the weather to break. 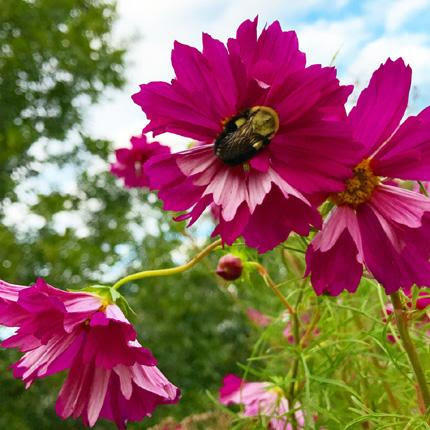 Grab a pair of discount flower show tickets and make plans to go to the show in a couple of weeks with a fellow gardening friend…or for a special date night! That, my friends, is how we get through winter in CT. 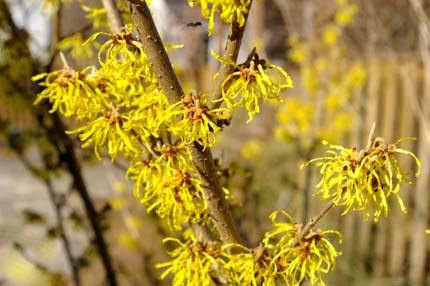 I have witch hazel opening in a vase on my desk. What branches are you forcing this week?